Watford City boundaries embraced 882 acres pre-oil boom. Since 2010, annexations and expansions have increased that size to encompass an acreage total of 5,459 acres. And over 20 developments have gone through and completed the entire planning and zoning process, representing more than 2,800 acres. While the oil industry remains strong, Watford City is still not seeing the price of rental housing fall to the levels being seen elsewhere in the oil patch. While there is concern from many that anticipated low oil prices will hurt drilling activity, in western North Dakota, Veeder says that with McKenzie County’s low breakeven point for well profitability, drilling activity has and will remain strong in the county. The breakeven point for McKenzie County wells is $27 a barrel and with oil prices in the low to mid-$40s a barrel, there is still room for profits. Which is why McKenzie County remains the epicenter for new drilling activity in the state. As of Sept. 9, 2015, McKenzie County had 25 of the state’s active rigs, followed by Williams County at 15, Mountrail County at 14, and Dunn County at 13. According to Lynn Helms, North Dakota Department of Mineral Resources director, he expects to see 25 rigs drilling at the $20 to $30 a barrel level with 19 frac crews working in McKenzie County in 2015. If that $20 to $30 level stays consistent over the next two years, that would still leave McKenzie County with 16 rigs in 2016 and 19 rigs in 2017. In 2015, McKenzie County would have 3,248 active wells, 3,575 in 2016, and 4,031 in 2017. The interesting thing to note is that at the $20 to $30 level, both Mountrail and Williams counties would be hit pretty hard in 2016 and 2017. Mountrail County would have no rigs in 2016, all the way down from 14 in 2015, and Williams County would also have zero rigs in 2016, down from 15 in 2015. That means neither county would have frac crews working, which would hurt the oil and gas industry tremendously in those counties. Veeder says that regardless of what the price level is, McKenzie County will stay above 430,000 barrels of oil a day. He adds that the production piece will keep the county moving forward. According to Veeder, as production holds stable through 2017, the jobs that support the oil industry will remain pretty stable. Currently, there are 38,000 production jobs in the state of North Dakota and McKenzie County has approximately 30 to 40 percent of those jobs. And by 2025, that amount could grow from 38,000 to 100,000 production jobs in the state of North Dakota. Veeder also says that McKenzie County isn’t even close to getting all of its pipeline infrastructure, so that is going to be out there for a while with those jobs as well as production jobs. According to Sanford, rents in Watford City have come down a lot, but are still higher than elsewhere partly because construction is now slower than expected. Despite the housing, retail, and commercial development lagging behind, this past summer was the busiest yet for construction in and around Watford City. According to a demographics study, a population of 20,000 is projected for Watford City. And based on that number, the city needs 10,000 housing units within the next five years. Out of those 10,000, half should be single family homes, but so far the city has only added around 50. 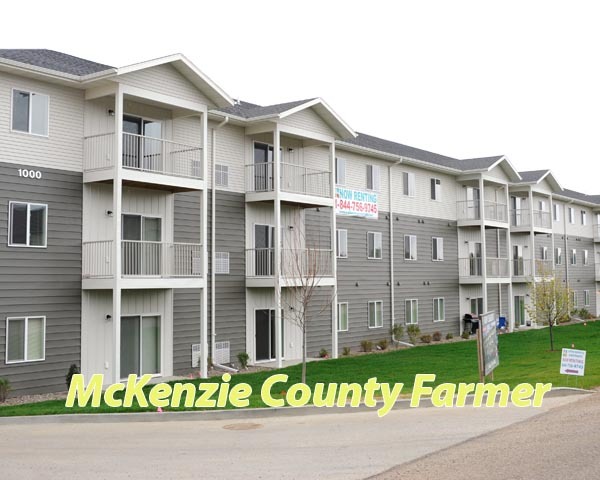 “The housing market shows that we need 10,000 units around here,” said Veeder. “ We’re not even close to that. We just need to figure out what people want and then meet those needs. Apartment complexes were the first to be constructed as developers were competing for $3,000 and $4,000 per month rental rates. However, rents have come down to the $1,600-$2,200 range in recent months. But if an increase in drilling occurs, people can expect rates to follow. According to Katie Walters, part-owner of Homestead Management in Watford City, Madison Heights was at 40 percent occupancy just this past June-July, and with the decrease in rental fees, their occupancy has gone from 40 to 75 percent in just a couple short months. Another housing development manager, Kyla Chamberlin, says they have also brought their rental rates down as well. Veeder says it’s fair to say that developers are wondering what is going on here with the oil and gas market. As a city and county, Veeder says everyone is trying to take a long-range approach, not just a short-range approach here.